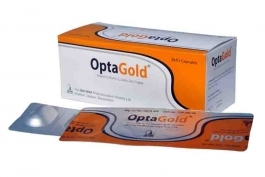 OptaGold capsule (Vitamin E, Vitamin C, Lutein, Zinc, Copper) is a vitamin & minerals supplement. Indicated as antioxidant for Age Related Macular Degeneration (ARMD) & cataract and to provide nutritional support for the eye. OptaGold is available as 8x4's alu-alu blister pack.